Mark Laprade of Bedford, NH has been named the Athlete of the Month for July 2018. Mark’s been a steady fixture on the New Hampshire road race scene for a couple years now; gradually developing a reputation as one of the state’s most consistent finishers. A two-time Northeast Delta Dental Points Chase champion, Mark is well on his way to another strong showing! 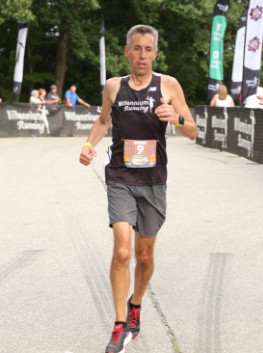 His 4th place performance at the Enterprise Bank Boot Scootin Boogie 5k was just another example of Mark’s ability to finish at the top of the pack. His time of 17:38 was 37 seconds faster than his previous year’s performance. Mark’s determination to consistently improve inspires others to raise the bar themselves! Mark’s speed certainly helped get him to this point, but it truly is his incredible attitude that make him July’s Athlete of the Month. The first to pick up the spirits of a down runner, or offer a high five to celebrate an accomplishment, Mark is a great support system for the running community in New Hampshire. For our staff here at Millennium, it’s been fun to watch Mark evolve into the confident runner he’s become. Next month, Mark will take his talents overseas to attempt a sub 3-hour marathon! Will he come home with another points chase victory? Is this the time Mark breaks 3 hours in the marathon? Only time will tell, but one thing is for sure – Mark will have a smile on his face and some positive words either way! And that’s why he is July’s Athlete of the Month. Congrats Mark and good luck in your future running endeavors!